Remember the last really lousy meeting you had to sit through? You have a whole pile of work back in your office, but you are stuck here in yet another soul sucking meeting that is going absolutely nowhere. Poorly run meetings are incredibly common in healthcare and a MAJOR cause of burnout in physician leaders - especially if you are a "straddle leader" with both clinical and leadership roles. Wouldn't it be great if you could stop the downward spiral and get the meeting back on track - even if you aren't the person running it?? Let us show you how to save any meeting from the back of the room with the "Guerrilla Facilitator's Manual". 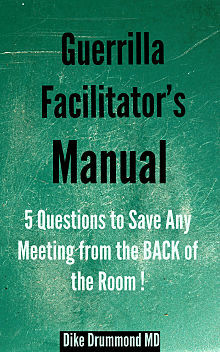 The five questions in the Guerrilla Facilitator's Manual will allow you to dramatically amp up the productivity of any meeting from your position at the back of the room. The questions are so subtle even the meeting leader will thank you afterwards. Grab your free copy of the manual and take it to the next meeting that has historically been a time waster for you. Be the guerilla in the back of the room and see how just one of these questions can make a world of difference for you and the team.